Volkswagen 2016 Passat, a refreshed model of the 2011 debut version, made its debut this week. However, this is not the best timing for launching a new model for this automaker. Recently, the company admitted that it had been using fraudulent means during emissions testing procedures and as a result, the EPA is expected to fine the company an amount that might rise to $18 billion. With such charges facing the company, it is definitely not the best time to launch a new model. In the U.S. alone, the EPA revealed that there is a possibility of over 480,000 VW models facing issues related to emissions tests, which is just a fraction of the world’s total. Even though the timing of rolling out the new Volkswagen 2016 Passat is bad for this giant automaker, the company has done just enough to ensure that this new model stays up to date with the latest technology and innovations as well. You will come across an Apple CarPlay system as well as Android Auto, in addition to a new interior and exterior design. However, the standout feature of this new car is the infotainment system, which goes by the name Modular Infotainment Platform II or simply MIB II. This new system gets a new capacitive touch screen, replacing the old resistive touchscreen which, honestly, has been quite a blight on the many dashboards they appear in. Due to the switch from a resistive screen to a capacitive screen, the system will feature multi-touch gestures so as to ease the usage of Android Auto and Apple CarPlay. With these new additions, you should feel like being part of the current generation when inside a Volkswagen 2016 Passat. Volkswagen has been at the center of past criticism with respect to the visual appearance of the outgoing Passat. However, as if the company was responding to its critics, it has stepped up the looks of the 2016 Passat, even though the changes are not very radical. If you’ve been inside a VW, the slightly changed interior shouldn’t take your time to re-adjust. The front part of the new Passat gets brand new headlights, a wide 3-slat grille and a hood with 4 creases and a fully redesigned bumper. On the rear you will notice some changes as well, among them fresh tail lamps and a redrawn trunk lid. You can also get an R-Line option for the 2016 Passat, which happens to be the first time VW is doing this. This model brings new bumpers, 19-inch alloy wheels that have been wrapped with ZR-rated tiles, a special rear bumper fixed with a small air diffuser as well as side skirts. Regardless of the trim level, all 2016 Passat models will ship with a post-collision braking system which has been designed to stop the car following a collision, hence reducing the risk of any damage that might come from secondary impacts. There is room for buyers to add more electronic driving aids to the package; for instance, the lane departure warning system, adaptive cruise control, parking sensors as well as a blind spot monitoring system. 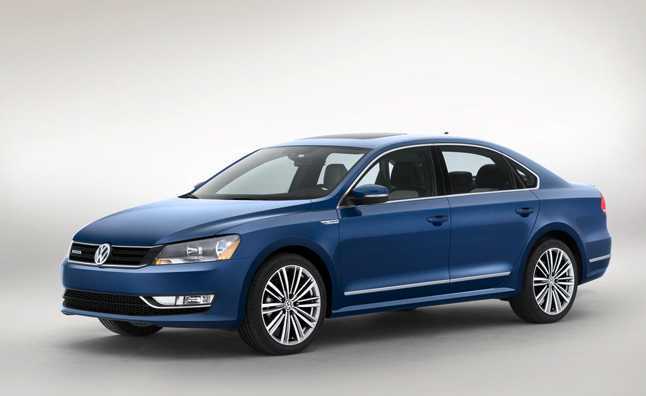 Even though it’s a new model, Volkswagen has not effected wholesale mechanical changes to the new 2016 Passat. In this regard, you will come across three engine options. For the entry level, there is a turbo-charged 1.8l 4-cylinder TSI, however, there is an upper model with 3.6 liter VR6 engine that manages 280hp. A third model is a turbo-diesel 2-liter 4-cylinder TDI, but at the moment the car maker has been banned from selling such oil burners to U.S. customers thanks to the Dieselgate scandal. Both the TSI and TDI engines can be linked to an auto or manual gearbox, but the VR6 model is exclusive to the double-clutch DSG transmission. The 2016 Volkswagen Passat is set to be released before the end of this year and it will cost about $22,440 for the base model. However, full pricing information has yet to be published, but should be expected a week before the sales begin.